Whether you have oily skin like me or dry skin or anything in between, you should always set your foundation with powder to keep it in place all day long. I have two powders in my stash which I use to set my foundation, one for the winter when my skin is lighter, and one for the summer when my skin is darker. I use a fluffy, dense kabuki brush when applying both of these powders. 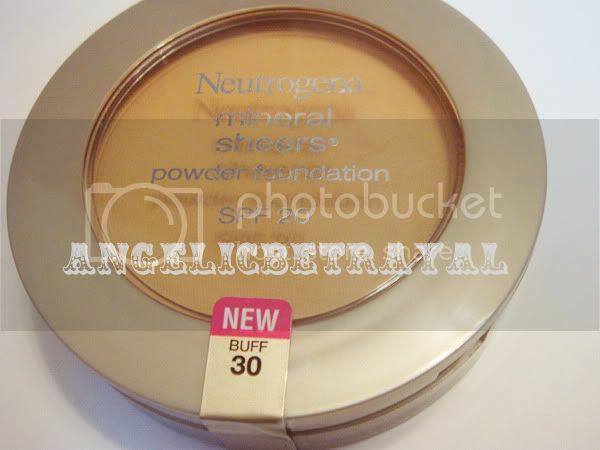 I bought the Neutrogena Mineral Sheers Pressed Powder Foundation over the summer when I needed a powder to mattify my face when I was going to Florida for vacation. I needed something to match my tan skin tone so I picked his up when it was 40% off at Rite Aid and I had a $3 coupon off Neutrogena cosmetics. The retail for this powder is pretty pricey for a drugstore brand and normally costs around $12-14 I believe. It comes with 0.34oz or 9.6g. There are a range of colors and I chose Buff in the hopes that it would match. The packaging is nice and convenient and there is a sponge and mirror in a separate compartment underneath the powder. I never really use either of them though since I do not touch-up my powder throughout the day and I do not use sponges to apply powder. The good things about this is that it is supposed to be a foundation meaning I can wear this over concealer and be done! There is not a whole lot of coverage but in the summer months when I do not want a lot of product on my face, this will suffice. I've been using this since the summer to set my tinted moisturizer and foundation and it has worked well for that too. This product does not leave a cakey finish and leaves my skin looking quite natural. There is also SPF 20 which is nice for everyday use and it does not make you look ghostly in pictures. However, I do not find that this controls my oily skin as well as Stay Matte after a few hours. But I think a variety of skin types can get good use out of this product. 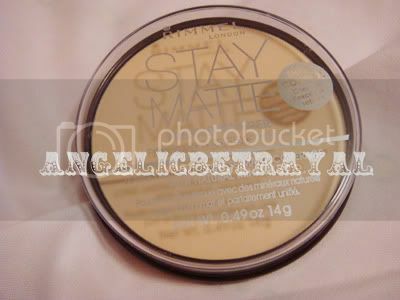 I purchased the Rimmel Stay Matte powder sometime in the spring when CVS had a buy one get one free on Rimmel products. This powder retails for $6 I believe and I ended up paying about $3. It contains 0.49oz or 14g, making it more affordable compared to the Neutrogena. But like me, you can always get these on discount and for relatively low prices. I got this setting powder because I had heard some good reviews about it. The packaging is simple and straight to the point with no fancy compartments or extra flair. But the cap on this is horrible as it constantly falls off and cracks easily. This would not be ideal to bring on the go for touch-ups as the cap will easily get lost and broken. I picked the lightest color in Translucent because I thought it meant clear. Apparently, I do not think that is the case and I should have chosen one of the darker shades. Nonetheless, it is not really pigmented so I can get away with using this when I am not tan. This works really well at mattifying oily skin and you must be careful not to over apply as it will lead to a cakey look. I like to concentrate this on my T-zone and lightly brush it along the sides of my face. I cannot apply too much of this anyway since it will make me look too pale. To counteract the pale-ness I usually apply some bronzer and blush to bring some color back into my face. If you pick out the right shade, out of the very limited shade selection, and you have oily skin you will probably enjoy this powder. If you have dry skin, you might not benefit from this powder. mandy: Try looking on iheartcvs.com or iheartriteaid.com or iheartwags.com :D They have the weekly circulars for the upcoming weeks so you can plan out what you want to buy. I highly suggest you sign up for the rewards cards from Rite Aid and CVS also if you go there often so you have access to the good deals. Thank you! My mom has a CVS card so I use that. But hmm I should look into the RiteAid card too!